The weaknesses and dysfunctions of the state that Kabila has shaped for nearly 15 years represent his best bet of staying at the summit of Congolese politics. 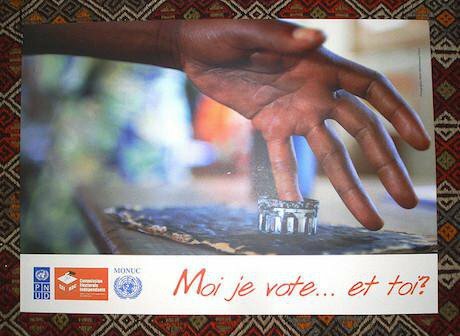 Election poster, DRC. FredR/Flickr. Some rights reserved.Towards the end of last month, on 25 October, the voters of the Democratic Republic of Congo went to the polls and elected representatives to sit in the parliaments of each of the country’s 26 provinces. That Sunday two weeks ago was the firing of a starting pistol which has launched a mammoth exercise in democracy during which, over 13 months and six different dates, the Congolese people and their new provincial legislators will take part in 12 separate elections, some direct (provincial and national deputies), others indirect (governors and national senators). At least that was the theory, the roadmap for what should happen between now and the end of next year. This was how it was laid out when CENI, the DRC’s electoral commission, published its schedule in February. In reality, however, the election of provincial legislators never took place and the starting pistol was not fired. It does remain possible that the two really significant elections – those for the National Assembly and the presidency – may take place during 2016 and indeed a vociferous insistence on precisely this point unites the DRC’s myriad opposition parties more than any other issue. Nevertheless, the prospects are not especially auspicious and a coherent electoral programme currently looks a long way off. Underfunded and lacking leadership, CENI is in disarray, its calendar voided by the constitutional court and a replacement as yet unforthcoming." 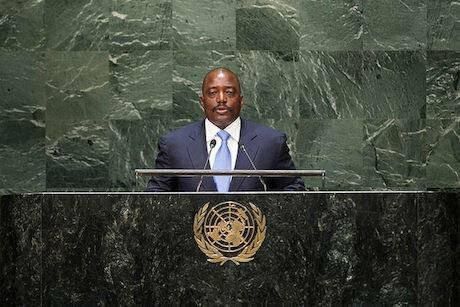 President Joseph Kabila of the DR Congo, 25 September, at the UN General Assembly in New York. UN Photo/Cia Pak/Flickr. Some rights reserved.The African strongman, allergic to relinquishing power and bent upon monopolising it well into old age, is something of a stock character. In the last year, plenty of stage time has been granted to such figures attempting to circumvent constitutional restrictions on presidential tenures. Burkina Faso’s Blaise Compaore, who in 1987 shot his way to the presidency, might caution an interested observer against manoeuvring to overstay one’s welcome. His efforts to amend the Burkinabe constitution to remove term limits provoked enraged protests in October 2014 and resulted in a humiliating exile. 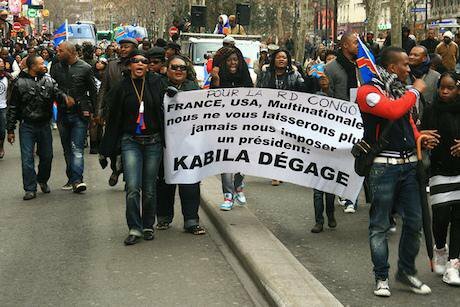 Protest against the president of Congo Joseph Kabila took place in Paris, February the 18th. Jelena Prtoric/Flickr. Some rights reserved.Yet, even if Kabila were able to secure sanction to take part in the next presidential election, his prospects for victory would be significantly worse than they were in 2011. He comes from the Swahili-speaking east of his enormous and fragmented country. As such, Kabila has always lacked support in Kinshasa, as well as the largely Lingala-speaking west and Tshiluba-speaking centre, where the men he previously overcame – Tshisekedi, an octogenarian veteran of the Congolese opposition, and Bemba, currently on trial in The Hague for war crimes – remain the most popular politicians. Both Kamerhe and Olivier Kamitatu, a leading figure in the G7, have made positive noises about Katumbi’s credentials to challenge Kabila. If the DRC’s famously fractious opposition can maintain discipline and unite behind a single candidate, the man currently on the throne would struggle to prevail – even if he was allowed to compete. A Katumbi candidacy leant the support of influential westerners is presumably the stuff of Kabila's nightmares. Congolese President Joseph Kabila proposes a toast during a state banquet in honour of President Jacob Zuma at the African Union Village in Kinshasa. GCIS/Flickr. Some rights reserved.Kabila, as is his introverted way, has so far declined to reveal his intentions and his spokesman has claimed simply that the president will respect the constitution. Yet, no one has unequivocally stated that he will step down in 2016 – as that very same constitution demands. 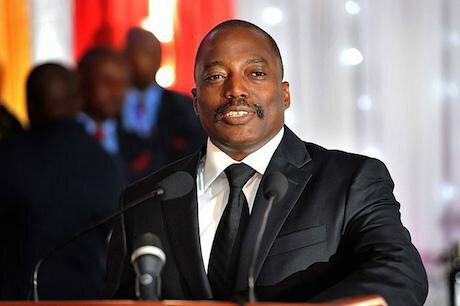 As such, the dominant view is that Kabila has no desire to surrender the presidency and, bereft of the option of altering the constitution, has alighted on an alternative, as simple as it is crude: to prolong his day of reckoning as long as possible and use the intervening time to come up with a way of re-legitimising his mandate at some unspecified point in the future. 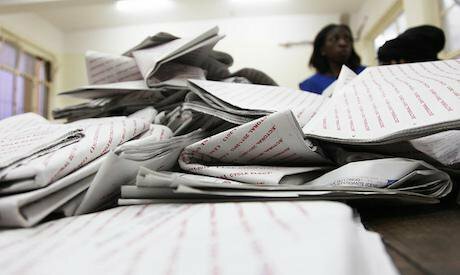 CENI counting the ballots. Elections Day 2011. MONUSCO / Myriam Asmani/Flickr. Some rights reserved.If CENI was not in any position to fulfil the requirements of its own schedule at publication, it is in even worse shape now. The commission is poorly resourced and again, some say, this is a deliberate ploy by the government. CENI claims it’ll need more than $1.1 billion to organise and hold all the elections outlined in its schedule and, formally at least, the government has allocated that amount in funding from this year’s budget and the preceding three. Yet, CENI has stated that less than 20 percent of the money had been disbursed and is therefore unable to function properly. 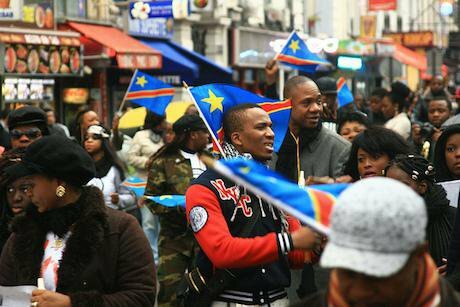 Protests against Joseph Kabila, President of Congo, in Paris. Jelena Prtoric/Flickr. Some rights reserved.In certain important aspects, Kabila is weak and getting weaker. He is fast approaching the end of his legitimate time as president and his options for altering that inconvenient fact through legal means appear almost non-existent. Western donor governments repeatedly have warned him against taking the leap into an unconstitutional presidency. He has less popular support in the crucial east of the country after first Kamerhe and then Katumbi broke allegiance with the PPRD and now faces the possibility of an unprecedentedly formidable opposition coalition cohering against him.